ABC News Analyst. Former Presidential Advisor. 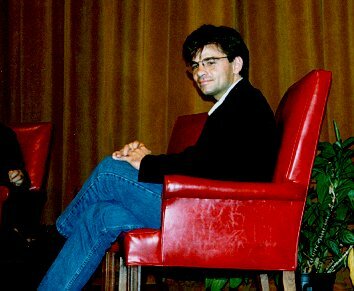 (Picture of George Stephanopoulos taken at the premiere of D. A. Pennebaker and Chris Hegedus "The War Room" presented at the Virginia Festival of American Film, October 1993 in Charlottesville, Virginia). "During the 1992 presidential campaign, the filmmakers D.A. Pennebaker and Chris Hegedus were given access to the 'war room,' a suite of offices inside Governor Clinton's headquarters in Little Rock, Arkansas, where the candidate's media strategy was plotted. War Room, the documentary film that resulted from their work, vividly demonstrated the warrior state of mind of modern campaigns' it also revealed, without commentary, the amoral and ultimately apolitical attitude of approaching political communications solely as a battle of images, waged through mass media. The documentary focused on Bill Clinton's tow chief handlers, George Stephanopoulos and James Carville. The candidate himself is seen for less than thirty seconds in the ninety-six-minute film. Stephanopoulos and Carville are present in nearly every frame" (Edwin Diamond and Robert A. Silverman, White House to Your House/Media and Politics in Virtual America, Cambridge, Massachusetts: MIT Press, 1995). George Stephanopoulos new book 'All Too Human: A Political Education' "overlaps and picks up where 'The War Room' left off. The documentary drama used hand-held camcorder footage and news reels to showcase the madcap, behing-the-scenes world of the '92 campaign. Sephanopoulos takes the same fly-on-the-wall perspective into the West Wing of the White House with revelations that include how Clinton and others resorted to searching randomly through congressional directories for a new attorney general candidate when Zoe Baird and a second moninee tanked following controversy" (James N. Thurman, The Christian Science Monitor, March 25, 1999). "Inappropriate, gossipby asides gratuitously exploit Stephanopoulos's close relationship with the Clintons, developed in the high-pressure atmosphere of decisionmaking. Letting the reader in on the president's private phone calls, for example as he does with a conversation the president had with Sen. Robert Kerry during the budget cliffhanger of his first term, shows Clinton's legendary hot temper, and, unnecessarily, his biting profanity" (James N. Thurman, The Christian Science Monitor, March 25, 1999). "The larger message the book conveys is a luke-warm scolding to a gifted and idealistic president whom Stephanopoulos believes wasted a golden opportunity. But even at the harshest moments, he takes the sting out of most of the scolding with prefaces of explanations or excuse" (James N. Thurman, The Christian Science Monitor, March 25, 1999).